I did not follow through on my threat to have Lady Gaga accompany Rieko Aizawa in her Chopin recital at the posh Shelburne Farms, Vermont last night. Jeff and I got to go to the event, part of the Vermont Mozart Festival, because he is something of a big wig at the University of Vermont, so he gets to hobnob with other big shots. I went along for the ride. I’m sure he was nervous taking a Vermont woodchuck like me to a civilized event like that, but he didn’t show it. I made sure to dress to the nines, by wearing black running shoes, a nice clean pair of Carhartts and a lovely checkered blue shirt I bought at Goodwill. As you can see, I know how to pull things together. 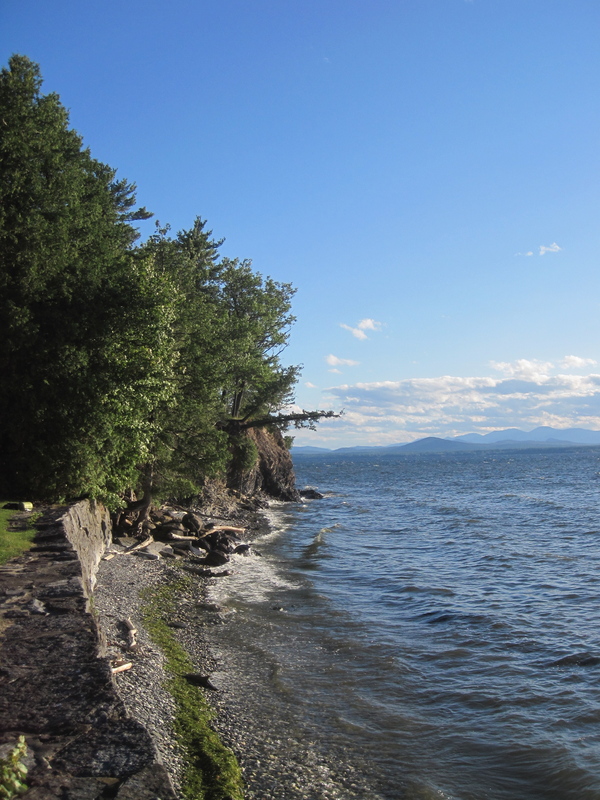 The evening view of Lake Champlain from Shelburne Farms before the Chopin concert. 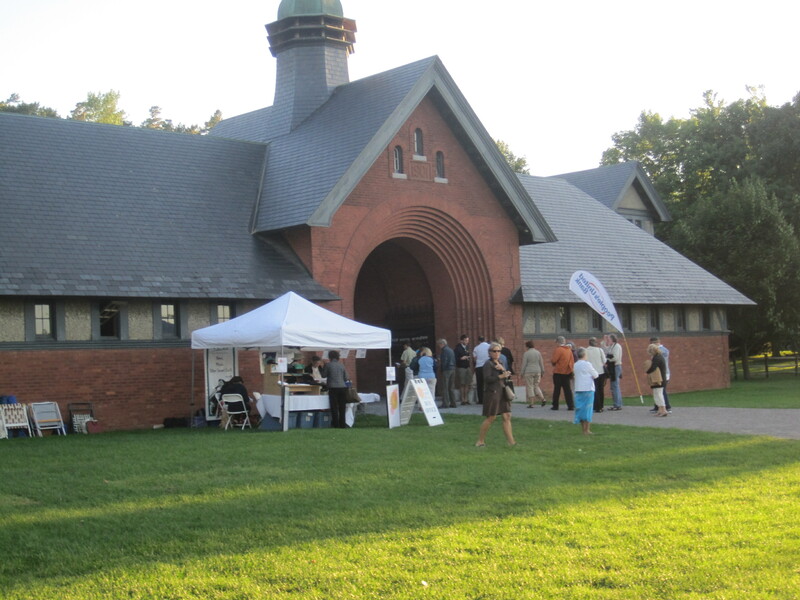 It was a spectacularly beautiful evening at Shelburne Farms, a meticulously groomed property on Lake Champlain. The heat and humidity had been flushed out of the state early in the day to be replaced by bright blue skies, a cool fall-ish wind and green scenery. 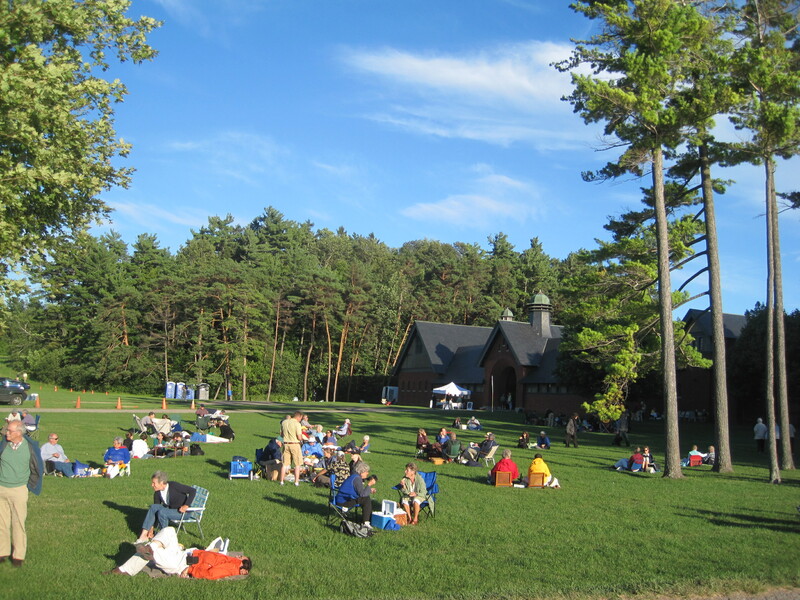 Before the Chopin recital started, the crowd picnicked on the breezy lawn with glasses of wine and gourmet food. Jeff pulled off a nice meal by bringing prosciutto, cheese, vegetables, dip and wine. Unfortunately, he brought no corkscrew, so as he set up dinner on an Irish wool blanket, he sent me into the crowd of picnickers in search of a corkscrew. Like a homeless man begging for change, I dove in, “Spare a corkscrew? Spare a corkscrew? A nice group took pity on me and gave me an expensive one to use, so the evening was saved. It was then time to go in to see the performance. Being a Vermont hick, the tradition at concerts I generally go to is to find some woods before the show in order to go to the bathroom. But can you really do that at a Vermont Mozart Festival event? There was plenty of woods at Shelburne Farms, after all. However, I managed to suppress my inner Vermonter and waited patiently in line at the bathrooms. I was really proving I could behave myself. Since Jeff is such a big wig, we had reserved seats, with our names on them and everything. So we really were Very Important People. I’m sure everybody else at the recital could tell that was true. I never really have been to a classical concert like this before. Aizawa, a pretty woman in a sleeveless red dress, appeared and immediately performed magic with the piano. It was getting cold, though, so after the first piece, she fled the stage and returned wearing a black sweater over her gown. Some of us were afraid she’d end up in a snowmobile suit and thick mittens by late in the concert, which potentially could have hurt the quality of the performance. 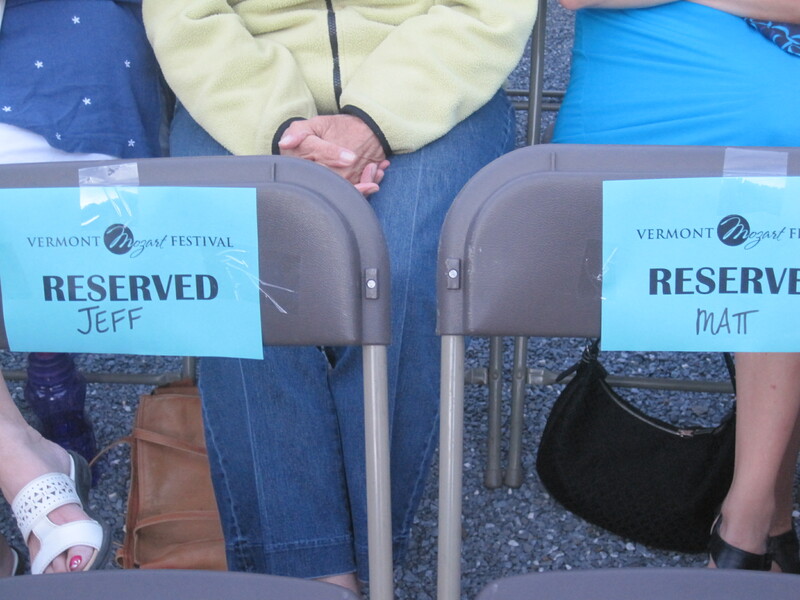 Since Jeff and me are VIPs, we got special reserved seats at the Vermont Mozart Festival Chopin recital at Shelburne Farms, Vermont Friday evening. But Aizawa was a trouper, playing through the cold, the obnoxious crying toddler in the background, and the moths dancing under the lights around her. But as I said, I left Lady Gaga at home, so at least Aizawa did not have that challenge to deal with. It was fascinating watching Aizawa’s whole body flow into the piano performance, lost in the emotion of Chopin. I got lost in the music too, as I watched the pine trees sway on the windy lakeshore in the fading evening light, the clouds drift overhead and the stars appear, one by one, in the sky over Shelburne Farms. So, now I’m a cultured dude, ready to take on other high-end shindigs. I think next year, I’ll see if I can get a Mozart quartet to work with a Tammy Wynette impersonator. Worth a shot, right? This entry was posted on August 7, 2010 at 12:04 pm and is filed under Uncategorized. You can follow any responses to this entry through the RSS 2.0 feed. You can leave a response, or trackback from your own site. wow! you and jeff are so important and well-known your last names are not even necessary on your reserved seats. impressive! Just to set the record straight, Matt sees himself as a country hick, but he has more class than he thinks. After all, those Carhartts had a proper crease in them.